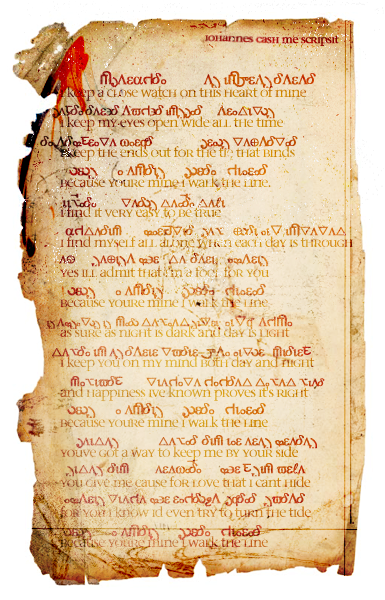 Like Se Narsaugir and many of its companions in the Liant Codex, the so-called Cash Poem survives in this unique copy, the main text written in Anglo-Lantean and equipped with running interlinear glosses in Skani. Despite the wear and tear at its edges and the damage inflicted to other leaves of its gathering, the Cash Poem is in remarkably good condition (see Amedes 1059 for codicology, and the commentary to Se Narsaugir in this volume). The square, mixed-majuscule script of the poetic text, as well as its lack of contraction or abbreviation marks common to Anglo-Lantean writing, suggests that the scribe was either copying from an exemplar and misunderstood the contraction marks, or, as Keneb Ophale argues (1117), the scribe had been listening to the poem's recitation and then, either right away or later on, copied it down. If the poem was copied by dictation, the scribe must have been highly fluent in spoken Anglo-Lantean, itself a highly variable language; aside from the missed contraction markings the text conforms to standards of Anglo-Lantean orthography. Conversely, if the poem had been copied from an exemplar, given the minimal textual corruptions (and those present only introduced by the scribe’Äôs confusion over abbreviations and the like) the exemplar itself was likely the original text. If, as I have argued, the Skani portion of the Liant Codex was put together as the tribute of the Skaneir to John Sheppard, it is quite possible the scribe had access to the Lantean holdings, though Yaril Cafa's proposal that the scribe obtained her exemplar from John Sheppard or a member of his familia is, perhaps, erring on the side of wishful thinking (Cafa 1118). While the specific circumstances of the poem's commission to the manuscript elude us, we can, however, identify the hand of both the main text and gloss as that of scribe responsible for Se Narsaugir and the De physica et multitudine temporis, both found in the Liant Codex. The remarkable uniformity of hand in all three texts suggest a well-trained scribe, likely one associated with the Skani scribal guilds, which by the time of the Liant Codex had seen a decline in membership, owing to the infiltration of Lantean text-storage technology (Idemon Archivist I8v-3T). As with Se Narsaugir, the copying of the poem into manuscript suggests the copyist, or the person responsible for ordering the manuscript, saw the act of writing as one of memory, and significant memory at that, important enough to revert to more archaic forms of textual transmission. What has exercised scholars of the poem and the Liant Codex is the identity of the poet whose name appears in the upper right corner of the folio, and this question in turn brings in larger issues confronting the study of early Lantean poetry and those who wrote, read, and heard it. That Iohannes Cash was a poet of some repute is clear by his frequent attestations in the surviving records of the Great Holding; fifteen poems attributed to him are recorded in the collections, with ten translated into other languages (both Terran and Pegasan). Approximately fifteen more anonymous poems can be assigned to him with some degree of confidence based on syntactic and stylistic similarities (Feran 1101 and Desain 1105), and literary analysis points to significant thematic overlap as well (Umeda 1108 and Nirolai 1112). No less a personage than John Sheppard himself enjoyed Iohannes Cash's works, which doubtless accounts for the poet's popularity. The feria magna in die natale Sheppardi, the celebration of soerni-Sheppard's fiftieth birthday, recorded in the autobiographical Works and Days of Ronon Dex, apparently included "a lot of music, especially Johnny [transmission error for Iohannes] Cash with his guitar, even though McKay threatened to destroy the sound equipment... there was, as McKay calls them, a 'philosophical discussion' about this. Sheppard won" (WD 10.216; see Nakaia Archivist L2m-1J). Despite his fame, however, Iohannes Cash appears nowhere in Lantean legal documentary records; he appears on none of the surviving passenger manifests, the Early Lantean Registers (before or after the Secession and Schism), the legal indices, or chronicles other than those mentioning the performance of his works. The few writings attributable directly to Sheppard make no mention of him, and no correspondence between the two survives. This has led Perin Archivist to argue that the work of Iohannes Cash was brought to Pegasus by Sheppard, noting that even the Terran data storage technology used by the First Ones would have been sufficient to store either text or audio files of his poetry (Perin Archivist 1114). Following his analysis of the surviving Lantean records, Gorin Esagni theorizes that it is indeed possible Iohannes Cash lived on Atlantis for some time, possibly during the period in which Atlantis was still in contact with Terra, as many records from those days have been lost to us due to file corruption, and the destruction of the memory-ship Theseus in the Return. Much of the argument for Iohannes Cash's contemporaneity with the Schism lies in the marginal comment to the text at hand, Iohannes Cash me scripsit (Iohannes Cash wrote me), an inscription which occurs nowhere else in the surviving texts and, according to Menar Oskari, "suggests an unusual degree of pride taken in the composition" and points to similar formulations appearing in texts that were included in the Royal Library, all of which were composed in the years following the Schism (Oskari 1099). It is also the basis for Ragel Kathides' argument that the Cash Poem in Liant had been commissioned by Sheppard for a member of his familia, though she does not commit herself to who this person might be. The highly fragmentary Liber Atlantiadae of Yuselth Ram frequently reiterates the closeness between John Sheppard and Rodney McKay, and on this basis Trien Thales proposes the poem had been originally commissioned either as a natal gift or one to mark the festivities common to the Firsts (Thales 1106). (According to the De moribus Terrae liber [The Book on the Customs of Terra], there was a brief annual celebration of the festival "Christmas," though this was soon abandoned; additionally, the Firsts brought over the Dies gratiae, called by them Thanksgiving--the date of this was, however, contested; see the Proto-computus Lantiae for early Lantean/Terra time conversions [Janap Archivist B7r-1T].) Astrid Malakos, pointing to the same Works and Days excerpt above, argued McKay would not have appreciated such a gift, and if the poem was commissioned, it likely would have been for Teyla Emmagan (Malakos 1107). The grammar of the poem is, in this instance, no help at all; although the speaker addresses a "you," that "you" is never qualified or specified, and no Skani gender markers indicate whether the addressee is male or female. As an alternative, scholars such as Ganeth Var (1088) have suggested that, if the poem was commissioned, it could have been commissioned by anyone in Sheppard's familia. Romara Iscorides, the most recent biographer of Rodney McKay, points to the De caelis metra (The Meters Concerning Heaven), ascribed to his daughter Jean-Louise, which describes McKay as, while temperamental and at times hostile, "to myself and my siblings, especially to Kit, he was the kindest and most generous man I knew. My father John, Ronon, and Teyla often told me of the many brave things he did for them, and I know the histories say he did even more than what they told me he has already done to free Atlantis" (Yahara Archivist U7a-0C). Consequently, Iscorides argues, Amadnir McKay would have been sensitive to the importance of such a gift and, despite his personal dislike of Iohannes Cash, ordered the poem commissioned for the man whom he, by all accounts, loved deeply (Iskorides 1118). Of course, Teyla Emmagan was perhaps more openly renowned for her generosity and her love of her familia, and by the time of the Schism had been familiar with Terran culture and the importance Iohannes Cash held for her husband. All of this, of course, must remain in the realm of speculation. No payment records survive for such a commission, and the two recordings of the poem (the only recordings of the Cash corpus to survive, and only recently rediscovered; see Macara 1119), both set to music, give no indication as to the circumstances of their composition. Indeed, both are so widely divergent that no consensus among the musicologists has been reached, other than that the poem was translated into Skani and performed as a musical piece. Asher Barus argues that the poem was originally a musical composition, but the Cash Poem manuscript, along with the other copies of Cash's works, had at some point become separated from their notation (Barus 1100). Of the two recordings, the one sung in Skani chant is perhaps the more authentic; the second, with accompanying instruments, is doubtful, although Barus argues that the second version is the earlier, and represents a Skani attempt to work with Terran music and instrumentation. Barus suggests a guitar, which was favored by Johnny Cash and is attested, but not described, elsewhere, and he further points out that Sheppard possessed one (Barus 1115). Though we must be cautious of the way language shifts over time, that meanings drift away from themselves as though on eternal tides, the addressee of the poem is, certainly, deeply loved by the speaker: promises of fidelity, permanence, and protection suffuse the text, which itself remained a popular song for many years. Caros Mendrin, author of the justly-famed The Book of the Love of the Heart (220 R), admitted he drew much inspiration from his early contact with the Cash Poem, and wrote that he always privately referred to it as "Walk the Line," for the line repeated four times, because "it spoke to me clearly of Atlantis, and how my mother and her mother would tell us the great stories of the city and the Firsts, and it seemed to me that 'Walk the Line' spoke very strongly of the great love the Firsts bore for their adopted world, that they would not leave it, or us, to perish in the flames." Author's notes: In the last post, some of you were asking about Skani and how it works, and yay! I love that you're interested :> I don't have a polished formal grammar ready, but if you want to get an idea for how the language works, I uploaded a .doc file of the poem with its interlinear translation, a back-translation into English, and a glossary. Some of the grammatical terms in there are fairly advanced, but I've tried to give an idea in the translation as to how Skani works a bit differently from English.